Alright guys, while we were on Pinterest the other day we found a pretty ridiculous claim. According to this pin, if you’re crunched for time you can use marshmallows instead of icing on cupcakes. 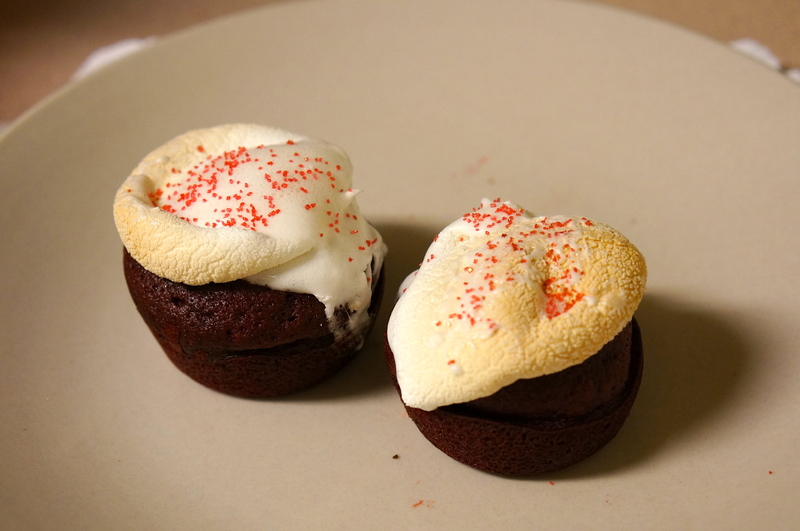 The pin states that you can just pop the already-baked cupcakes into the oven with marshmallows on top and they bake into nice little icing-pouffes. We (of course) decided to call shenanigans and give it a shot! 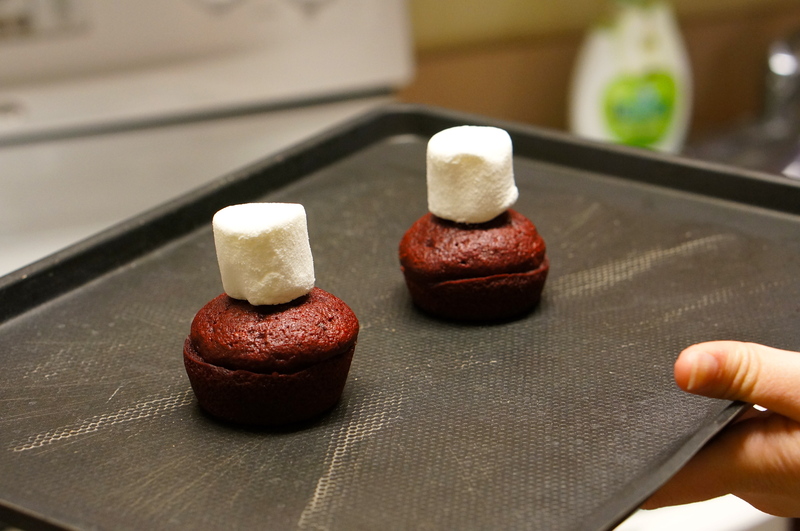 First, we made red velvet cupcakes and rounded up some marshmallows. 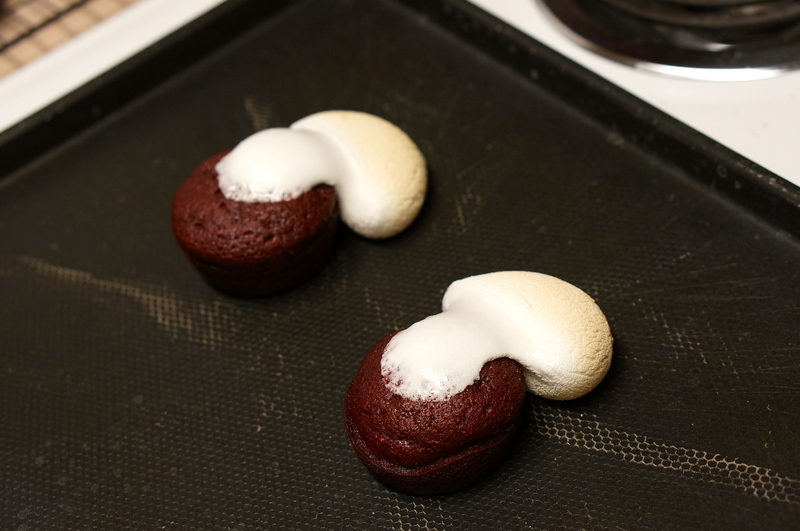 Once the cupcakes were cool we balanced a marshmallow on top of each (this was actually kinda tough) and placed them in the oven. We baked them at 350 degrees for about 8 minutes, but they came out like this! One second they were fully intact, the next they had melted over onto the pan! 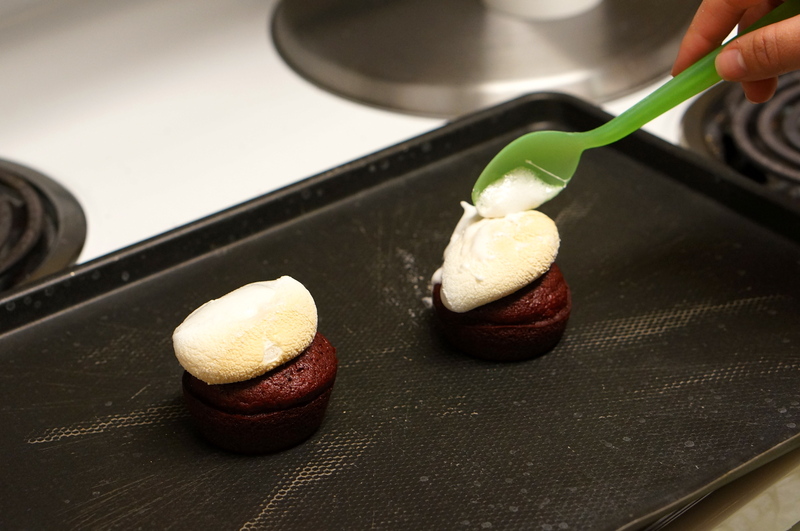 We used a spoon to scoop the marshmallows back on top of the cupcakes. While this pin didn’t work out as planned, we guess you could use this idea in a pinch. It doesn’t make for the prettiest cupcakes, but if you use sprinkles they don’t look too bad. Also, consider your audience. If you’re planning your best friend’s birthday party you may just want to splurge for the icing. However, if your audience expects a little less (in our case, our dorm neighbors), this does make a nice departure from the norm. We probably won’t use this trick again, but if you come up with a better way to achieve it, let us know in the comments below! Also check out some of our recent Shenanigans where we test the iconic Pinterest Edible Glitter Recipe and show you how to make a Homemade Peppermint Candy Plate. I haven’t come across this pin yet but as soon as I read the claim, I thought to myself “No way.” Definitely too good to be true plus I would miss some delicious buttercream frosting! Yeah, we thought the same thing! Also, we would have put the original link from Pinterest but the link was broken 🙁 ..Buttercream frosting sounds awesome right now though, we may have to look up some good recipes! I too, tried this after seeing it on pinterest, and was disappointed, My marshmallow looked terrible, not lovely and fluffy like the picture, and it didn’t even taste that great, I think this is a give it a miss pin. Marshmallows are too hard to handle, won’t try these! !